Currently viewing the tag: "affiliate marketing"
Flevy.com is the #1 online provider of high quality business documents, offering a vast and growing inventory of business methodologies, financial models, and PowerPoint templates. Flevy covers a wide breadth of corporate functions, from Information Technology to Corporate Strategy to Change Management. The business documents found on Flevy are of the same caliber as those produced by top tier management consulting firms. This morning, the company launched the Flevy Affiliate Program. Under this program, people can join as Affiliates and earn commissions by referring either Customers and/or Sellers to Flevy. Full details of the program can be found here: http://flevy.com/affiliates. By referring Customers, the Affiliate earns a commission on the Customers’ total purchase. The commission rate is driven by the total sales for that calendar month. The program is modeled after the Amazon Associates Program. By referring Sellers, the Affiliate earns ongoing commissions based on sales generated from the Sellers’ documents. 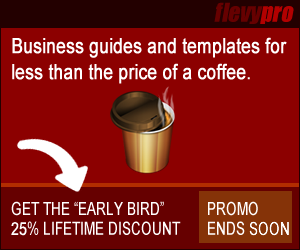 Flevy is offering increased commission rates–up to 15% on all sales–for early adopters to its affiliate program. Read the full press release here: http://www.prweb.com/releases/2014/02/prweb11551796.htm.